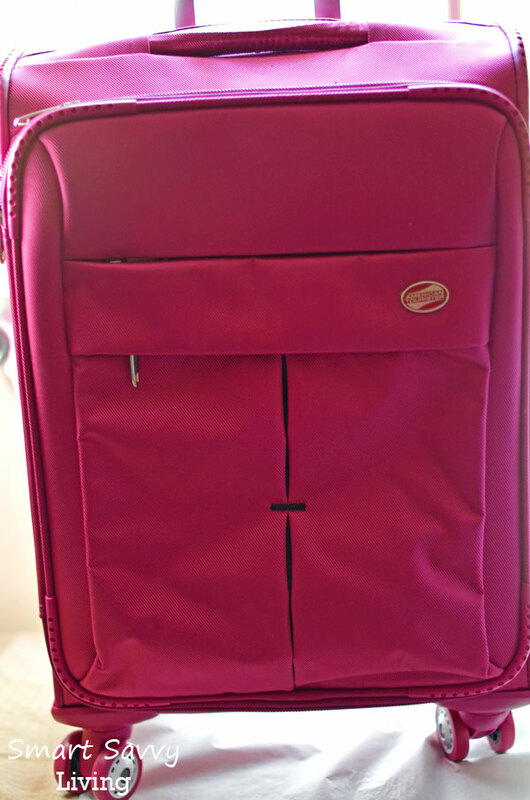 I received the following item at no cost in exchange for writing this honest American Tourister Colora 20″ Spinner Luggage Review. 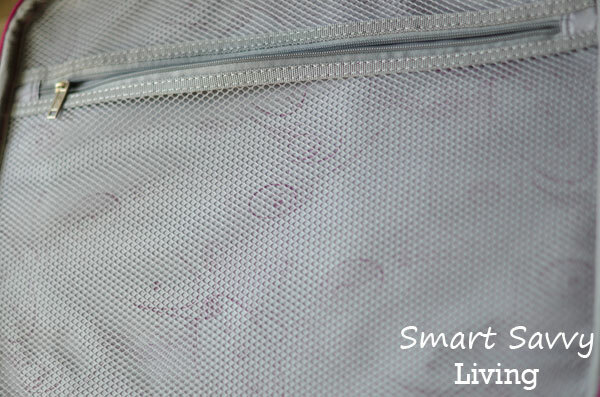 The exterior “front” of the bag also features a zippered area for easy access and storage of items so you don’t have to open the whole thing! Mr. 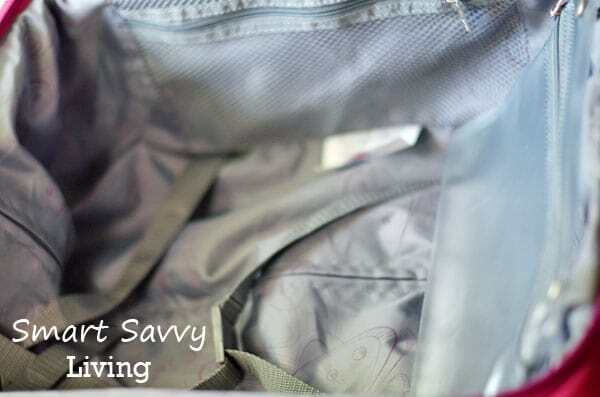 Savvy and I have always used duffle bags when traveling since we don’t have a set of luggage. However, they certainly aren’t the easiest to travel with being so bulky, especially when flying, so I was super excited to receive an American Tourister Colora Spinner to review! I even remember my mom using the American Tourister brand all through my childhood – the same luggage set, in fact, so I couldn’t wait to see if the quality was still the same. 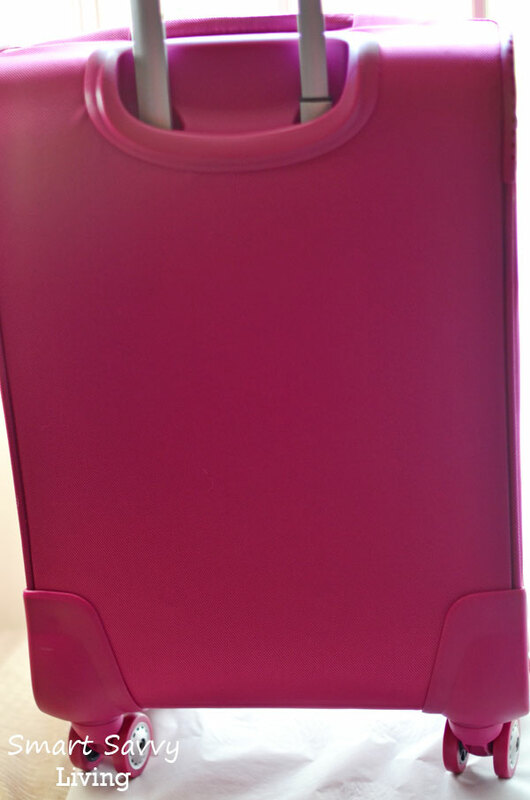 One of the things that struck me first off was the brilliant raspberry color! No boring black luggage here that can be difficult to tell which is yours. I’m honestly not a huge pink fan, so I was happy to see this is a nice magenta-like shade. It’s not a color Mr. Savvy is likely to want to use, but I’m just fine having this suitcase all to my onesies. ;) I also noticed that the luggage appeared to be very well made. The material is very thick with excellent stitching and all of the zippers look very well implemented and sturdy. I’ve had to deal with both stuck and broken suitcase zippers when traveling before and it certainly doesn’t help with relaxing! The feature of the suitcase I was looking forward to most, and it hasn’t disappointed, are the 360° spinner wheels. I’ve used rolling luggage before but I would get so frustrated by really only being able to go forwards or backwards, which isn’t overly helpful when trying to weave through a crowded area. The spinner wheels can go in any direction so you won’t find yourself getting stuck while on the go! Plus, there’s also 4 wheels for great balance no matter which way you’re trying to go. The interior of this suitcase is spacious and features 3 separate zippered areas for organization and easy access. Another feature I really like is that the suitcase has 3 handles. Two on the top, the retractable handle for pulling the bag and then a top handle for carrying. It also features a side handle for carrying as well. Getting to perhaps the most important part of any suitcase, the interior and how much it will hold; I was not disappointed. I really loved how smartly this suitcase was made with straps for stability, but also 3 zippered areas for easy access and storage (2 on the base and one on the flap that opens. Even better is that one is a removable clear plastic bag for all those items that can leak. Lotion or shampoo all over your clothes when traveling is not a welcome sight, bleh! Final Takeaway: I think that the American Tourister Colora 20″ Spinner is awesome and can’t wait to use it for hopefully several years! I can honestly say that the American Tourister brand seems to still be made with the same quality I remember from over 20 years ago. Win It: Head over to our Summer Fun in the Sun giveaway by 7/31/13 to enter to win one of these suitcases, and other awesome prizes, for yourself! Disclosure: The items featured in this honest review were provided at no charge. Be sure to check out our other reviews if you enjoyed this American Tourister Colora 20″ Spinner Luggage Review!